Singer-Songwriter-Guitarist Kurt Cobain, and his band, Nirvana, seemed to come out of nowhere. Two years ago, the Seattle group’s major-label debut album, Nevermind, outsold such top guns as Michael Jackson, U2, and Metallica, and helped bring the underground punk movement into the music mainstream. “It had all the drama of htting the jackpot after a lotto purchase at 7-Eleven,” said one record executive. 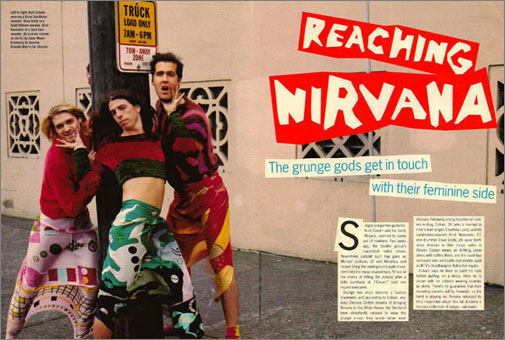 Grunge has since become a fashion statement, and (according to Cobain, anyway) Chelsea Clinton dreams of bringing Nirvana to The White House but the band have steadfastly refused to wear the grunge crown, they would rather wear dresses. 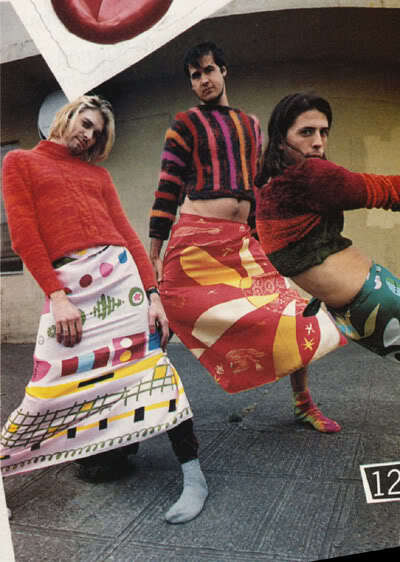 Following a long tradition of rockers in drag, Cobain, 26 (who is married to Hole’s lead singer, Courtney Love), and his bandmates-bassist Krist Novoselic, 27, and drummer Dave Grohl, 24- wear thrift store dresses in their music video In Bloom. Cobain wears an ill-fitting prom dress with ruffles, and the band has sashayed into well-publicized events such as MTV’s Headbangers Ball in full regalia. 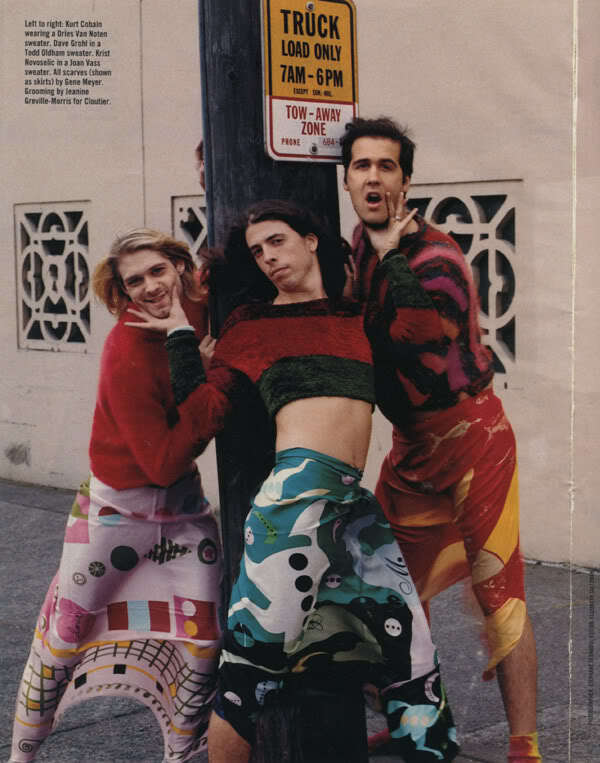 Cobain says he likes to paint his nails before putting on a dress. here he is shown with his cohorts wearing scarves as skirts. There’s no guarantee that their modeling careers will fly, however, so the band is playing on: Nirvana released its third major-label album this fall, In Utero, a raucous collection of songs. I'm really surprised some 15 year old South American fan with broken English hasn't commented on this yet. That sounds so racist. Not all of Nirvana’s fans are teenaged South American Girls with bad english. Im a teenaged South American girl and I find that offensive. I’m from Argentina, I’m 34 years old. I listen to Nirvana's music since January, 1992. I consider my self a huge fan of those three monsters of rock! I know my English is better than some americans teenagers. About your “concern”: you should be aware that not only no “15 year old South American fan with broken English” has commented on this page, but NO ONE AT ALL HAS. Now the question is: how many people have seen this note? I dare to say, just a few, and no one cares. All the time I feel sorry for those who express the same boring hate. They let as see nothing but weakness and smallness.